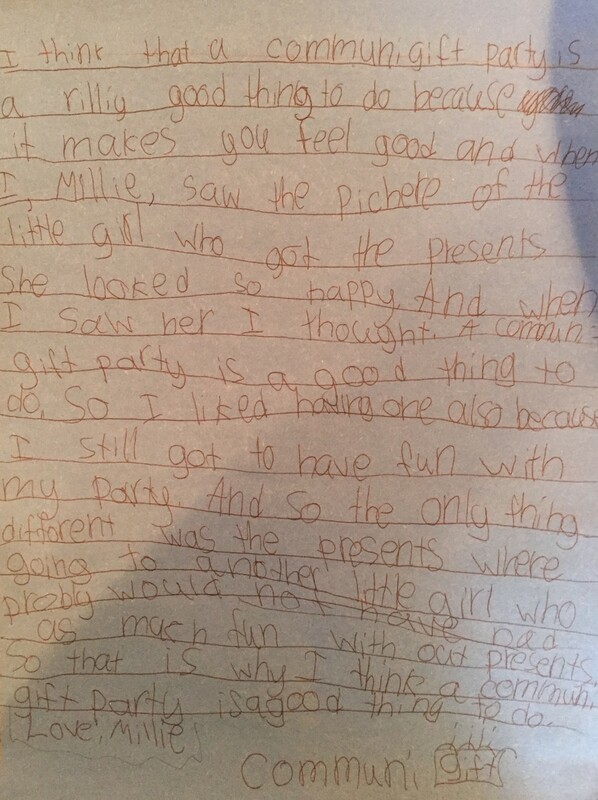 "I think that a communigift party is a rilliy good thing to do because it makes you feel good and when I, Millie, saw the pichere of the little girl who got the presents she looked so happy. And when I saw her I thought A communigift party is a good thing to do. So I liked having one also becuase I still got to have fun with my party And so the only thing different was the presents where going to another little girl who probly would not have had as much fun without presents. So that is why I think a communigift party is a good thing to do. Love: Millie"
Giving back... "It makes you feel good"
At just 8 years old, Millie has begun to learn an invaluable lesson that it takes a lot of people their whole life to learn. Giving back makes you feel good! A few weeks after her CommuniGift Birthday, she took the time to write down what she thought of the experience. Instead of the familiar "no gifts" party, Millie decided to try something new. Her parents showed her that, using CommuniGift, she could match with a "birthday buddy" and make sure they too were celebrated on their special day, regardless of circumstance. That was all it took. She quickly gravitated toward Abigail because they had the same birthday and because Abigail liked arts, princesses, and soccer, just like Millie! Millie learned that Abigail didn't typically get the same birthday experience that Millie was so used to, and she wanted to help! Of course, Millie was excited to have all her friends come together for her party, and after talking to her parents, she realized that it wasn't the presents that made her feel special. Creating memories with friends is what the day is all about. At the same time, she now knew Abigail was lacking a backpack and a warm blanket, and had never opened birthday presents before. 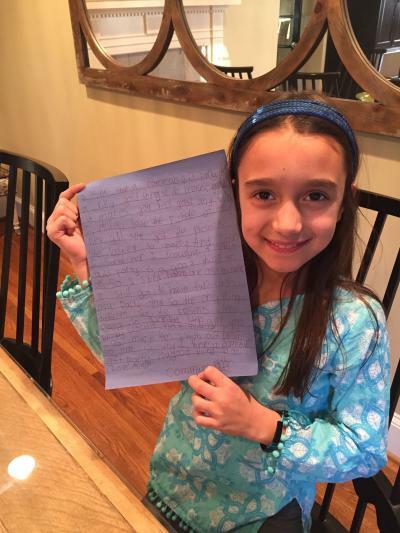 She decided to invite her guests to send gifts to Abigail in lieu of gifts for her. Her guests received their invitation and learned that they could RSVP and send a gift at the same time. The fun part (the "feel good" part) was that the gift would go to Abigail, who normally goes without on her birthday. 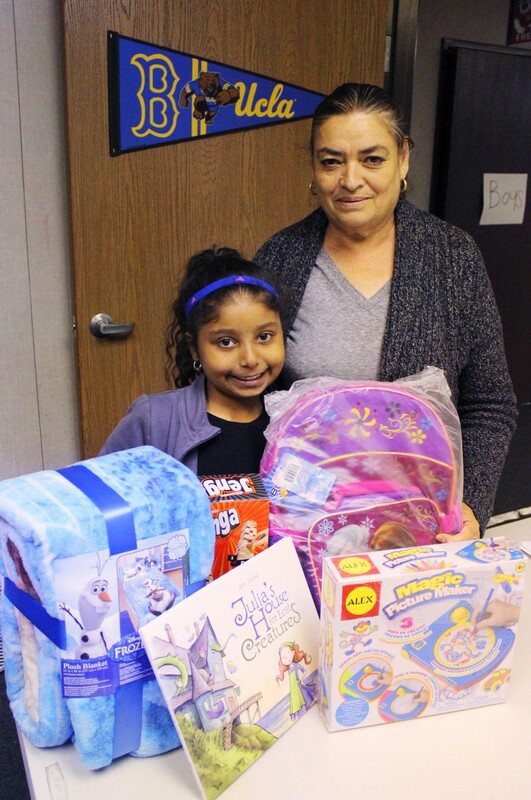 What's more, after Abigail's wish list was filled, her guests started giving to another birthday buddy, Luna! Happy Birthday Millie, Abigail & Luna!